This Isn't Voiceover Marketing. It's Spam. It's Also Illegal. 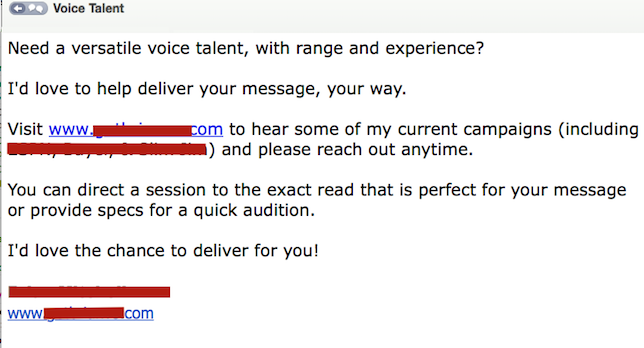 During the past two years I’ve received 8 unsolicited bulk emails from this voice over person. A couple of friends of mine report receiving the same. It appears he diligently is sending them every three months. It’s almost certain that he bought a list “contacts” in the voice over industry. Possibly some self-proclaimed marketing expert told him that’s a good way to market his services. But Is All Spam Illegal? In the U.S., spam (Unsolicited Bulk Email) is not illegal. But this guy’s spam is illegal. This spam doesn’t include a physical postal address. This spam doesn’t offer any sort of “opt out” mechanism. That’s 2 violations of federal law in one ineffective, image-damaging email. …by forwarding them to me with comments such as “Good grief!” — along with the occasional expletive. I’m guessing this guy just doesn’t know better. I’m guessing someone convinced him that buying a highly inaccurate, aggregated list and using it to beg for work is a good idea. What if it would have started with “Dear Dan,” ? But simply including the person’s first name doesn’t preclude its being spam. If your database has the name of each recipient, it’s easy to send a thousand or a million or 10 million emails, each of which is addressed to the recipient by name. But it still would be spam.